Proud to be certified as a NCAA 13.14.3 compliant scouting service. 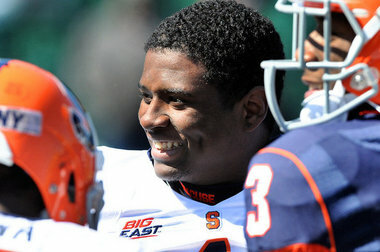 Syracuse, NY - Ashton Broyld can see some big things in his future with the Syracuse University offense. The Rochester native who set school records for running and passing at Rush-Henrietta High School can envision himself as the kind of dual-threat quarterback Orange coaches are seeking. But for now, the SU freshman also knows there are a ton of little things he has to work on – like running and catching – before he worries about the big picture. "Again, he is a special kid as far as talent. We have to bring him along where he can help us wherever it may be. He is a dual-threat quarterback, running back, which is where we had him mostly in the second half of spring football, and then putting him out there on the slot or outside wide. He is a big, strong, physical athlete. I think he is going to be a great asset to us offensively. We have to keep bringing him along because he is someone who can make a lot of plays." Beyond Athletics takes a look at how some former Section V football standouts faired for their first few months of college in 2011. The 2010-2011 AA High School New York State Player of the year Ashton Broyld, rebounded well from a very tough off-season filled with court dates after making a very serious mistake during a basketball game in Rochester, NY. "I've learned a great deal and I'm trying to focus on moving forward with better decision making at this point", says the Syracuse University commit. Broyld goes on to say, "I'm working on my academics, and being the best student-athlete I can be while making the most out of this opportunity." And that is exactly what he has done for Milford Academy this past season, standing 6'4, 230 lbs., some publications had him ranked among the Top 15 Athletes in the class of 2012. According to 247Sports, he's ranked the #1 athlete in the nation in the Class Of 2012. Broyld's athleticism helped lead Milford to a 12-0 season, and is looking forward to competing at QB for the Orangeman this upcoming season. As the 2011 football season begins, Rush- Henrietta athlete Chauncey Scissum is already on the recruiting radar for a number of colleges that include: Akron, Albany, Rutgers, Pittsburgh, Syracuse, Old Dominion and also some Div 2 and 3 schools as well. Scissum stands 6'2, and 190 lbs, and is just as focused in the classroom as he is on the gridiron. With a 3.5 GPA, Scissum is sure to make NCAA Clearing House and is projected to be one of the best Section V prospects in his class . As an athlete, he can play QB, WR, DB, and also excels in lacrosse. It appears after NYS Player of The Year , and former teamate (QB) Ashton Broyld departs for his freshman year at Syracuse University, the QB position for Rush-Henrietta is open for competition with huge shoes to fill in order for the reigning Class AA NYS Champs to remain a force, and defend its title. Scissum is more than qualified to get the nod at the position, but is willing to help the team out in anyway possible, as he is a very unselfish player. One position that he has seen some success at already is the CB spot. Scissum brings that QB mentality to the defensive backfield as he understands the game better than most. Along with smarts, raw athletic ability combined with speed, work-ethic, and a desire to be the best, he could be very dangerous for opposing quarterbacks. Look for Scissum to make plenty of plays on the defensive side of the ball this upcoming season, and don't be surprised if he becomes one of the rare All-Greater Rochester selections in only his junior year. From the moment he stepped on a high school varsity football field, he made a difference. Four years ago the 6'3 220lb giant known as Ashton Broyld was taking over at QB for a Marshall Jursist team that had just lost the NY State Championship the year before. He had some big shoes to fill, the team was loaded with talent, and expectations were very high. The only question was the new freshman QB. Broyld wasted no time exceeding expectations, after a slow start the team finished the regular season as the last and final #8-Seed entering sectionals. Up to this point on-lookers had seen only glimpses of greatness from the freshman. Once sectionals began, everyone would understand that a star was in the making. Broyld's team would face the #1-Seed Churchville Chili Lions featuring their own SU bound star Averin Collier. It was in the 4th Qtr, 4th and 7, his team was down 3 points with about 6 minutes remaining, the snap was low and the ball was fumbled to the ground, the freshman picked up the ball, defenders in his face, Broyld made it back to the line of scrimmage, and was hit by 2 tacklers, the freshman began to take the tacklers for a ride, as he took step after step, more defenders piled on, the QB was moving the entire crowd. Even more tacklers got involved, however nothing was stoping the momentum of the young star! Finally Broyld goes down, the referee says 1st Down! No measurment was needed, his team had renewed life and went on to win the game as Broyld put his team on his back, and took over the game. Those were the memories that were awaken by his latest football victory. The 2010 New York State Championship! The opponents were the Troy Flying Horses, after four years the entire state realized that as a QB, Broyld was hands down #1 in the state. It was his play in the second half that made him the State MVP, he had arrived as a overall football player. Broyld took over the defensive side of the ball, playing Outside Linebacker leading the defense with 8 Tackles, 2 Sacks and a Forced Fumble. Once again putting his team on his back, and showing true leadership. There hasn't been a high school player in the entire state of New York that had been more impressive in years. He had completed his high school career at the top, as his Royal Comets defeated Troy in the State Championship Game. Shortly after, the offers began to roll in for Broyld. And his desire to play QB led him to sign his letter of intent to Syracuse University under the direction of Head Coach Doug Marrone, who promised Broyld an opportunity at the position. If that doesn't work out for Broyld, he is open to different positions for the Orangeman. The Rochester native, is from a football family, his father, Ashley Sims, played QB for East High School, and earned a full scholarship to Maryland University, and his uncle Branden Albert, was a 1st-Round pick for the Kansas City Chiefs. 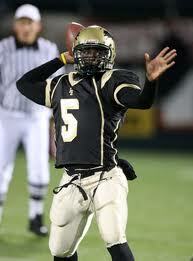 Broyld is part of the Class of 2011 that will open the door for Section V recruits for years to come. Congratulations once again to Syracuse bound Ashton Broyld, hopefully he can put the Orangeman on his back and take over a BCS Title game during his tenure there as well. Good Luck Ashton!